Former Arkansas governor and possible 2012 presidential hopeful Mike Huckabee was quoted as saying that Natalie Portman is glamorizing being pregnant and not married. He is now trying to explain his statements, saying he did not mean to “attack” Portman and he was happy she was marrying the father of her child. 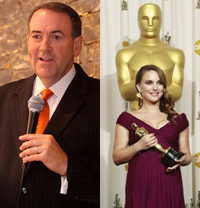 Mike Huckabee said that although Natalie Portman, who just won an Oscar for Best Actress for Black Swan, is a “very brilliant and admirable actress,” he thinks her pregnancy is sending a bad message. Portman, 29, is engaged and expecting her first child with Benjamin Millepied, the choreographer she met while filming Black Swan. Huckabee said that most single moms are not in the same financial position as Portman, and her pregnancy is “troubling” and it may “glorify and glamorize” having children when not married. “There aren’t really a lot of single moms out there who are making millions of dollars every year for being in a movie. And I think it gives a distorted image… Most single moms are very poor, uneducated, can’t get a job, and if it weren’t for government assistance, their kids would be starving to death and never have health care. And that’s the story that we’re not seeing,” he said. Huckabee said today that his comments weren’t meant as an “attack” and that he was “glad” that Portman was planning on marrying Millepied. Tell us: Do you agree with Mike Huckabee? Do you think it makes a difference that Portman is not a pregnant teen, but rather a 29-year-old woman? And how do his arguments apply to single women who want to adopt or want to raise a child as a single mom?